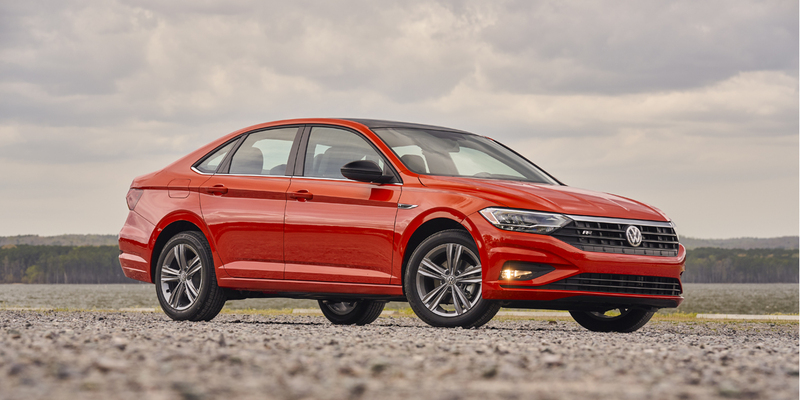 CG Says: The Volkswagen Jetta is redesigned on a new platform for 2019, gaining new technology features and slightly larger dimensions for improved interior space. Five trim levels will be available initially: entry-level S, popularly-equipped SE, sporty R-Line, SEL, and top-line SEL Premium. The sole engine choice on all is a turbocharged 1.4-liter 4-cylinder rated at 147 horsepower. The base S model comes standard with a 6-speed manual transmission; optional on S and standard on all other models is an 8-speed automatic transmission. The performance-oriented GLI model is absent from the model roster for now, but is expected to return soon. Available features include forward-collision warning and mitigation, lane-keep assist, blind-spot alert, rear cross-traffic monitor, adaptive cruise control, and Apple CarPlay/Android Auto functionality. The Volkswagen Jetta loses a bit of ride/handling refinement with its redesign for 2019, but it adds interior space, slightly better fuel economy, new infotainment features, and very competitive prices—all traits that should appeal to the mainstream shoppers that VW is pursuing with this vehicle.